In biblical times, a person's name indicated and pointed to their individual character. In keeping with that model, here at Gainesville Bible Church we hope our name communicates our character and our ministry. 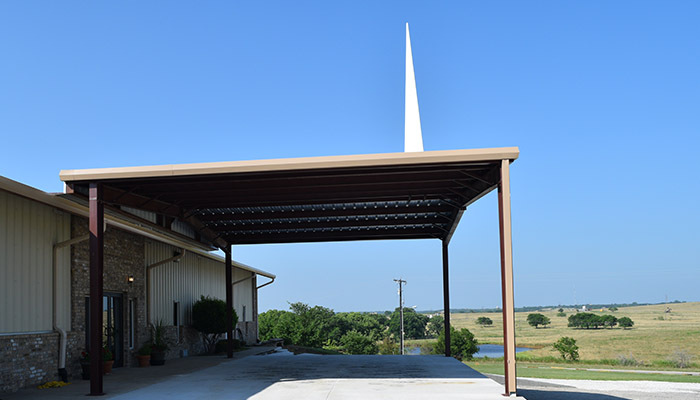 We as a local body of believers recognize our calling to minister to the community of Gainesville, TX and the surrounding areas by proclaiming the Truth of God as revealed by His Word and striving together to live that Truth in our community at large. We welcome you to our services. If you live in our vicinity, we cordially invite you to be a regular part of our local fellowship as we worship and serve Jesus, our Lord. We believe the 66 books of the Old and New Testaments to be the complete inspired Words of God - that's right - as though He spoke them out loud. The Bible is the Creator's communication to His creation. The Greek word for "church" is ekklesia- which literally means "called out ones". Our present home is within the world system-but our eternal home is far from the bleak confines of this planet. But while we remain, we understand our purpose is to be the hands and feet of our Savior Jesus Christ, continuing in the work He began: teaching, preaching, evangelizing, praying,worshipping,and serving. What is Worship Like at Gainesville Bible Church? Our worship is fairly simple and designed to keep the focus on God, not ourselves. Every week we gather to sing, pray, and hear teaching on God's Word. We have people of all ages and backgrounds in our church and encourage you to come as you are! It is our goal to create an experience of worship that is transforming hearts more into the image of God. We want everyone to encounter God when they worship with us. Every word in the original writings of the Holy Scriptures is inspired by God and without error. It is accurate in all matters to which it speaks, spiritual, historical and scientific. 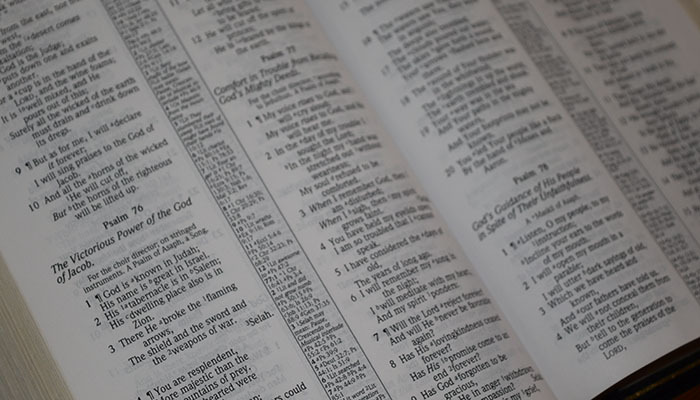 The Scriptures of the Old and New Testaments are the foundation of the faith and Practice of Gainesville Bible Church. The Father, the Son, and the Holy Spirit. The three have distinct personalities and yet are of the same substance, one God. The eternal Son of God became incarnate in the Lord Jesus Christ, being born of the virgin Mary, and is true God and true man. 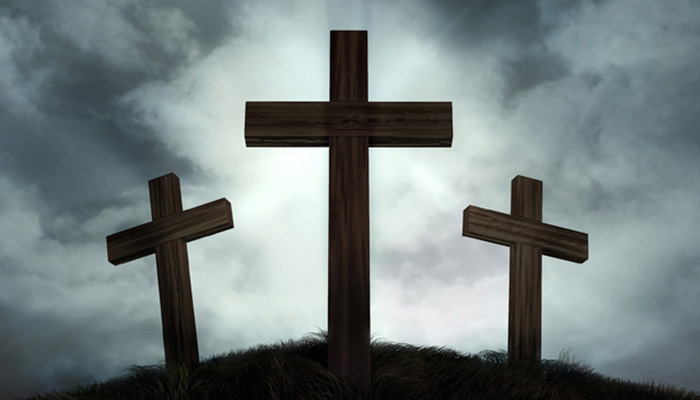 He died physically on the cross, was bodily resurrected three days later, and thereafter bodily ascended to heaven. The Holy Spirit is the third person of the Trinity. He regenerates, indwells, baptizes, and seals all believers in Christ at the point of faith in Christ, and empowers those yielded to God. Man is created in the image and likeness of God. In Adam, all mankind fell into sin with the result that all men are sinners. Men are justly condemned to eternal judgment and can do nothing to merit salvation. Salvation is received by faith alone in Christ. The only means to salvation is belief in Christ's substitutionary death and resurrection, which satisfied the wrath of God against the sin of the individual. There is an eternal state of punishment for the unsaved and an eternal state of blessing for the saved. Salvation is given to those men and women chosen (election and predestination) by God and drawn to Christ by the Holy Spirit. God's election of those that will be saved was made without thought to any merit of the individual and was made prior to the creation of the world. We believe that, owing to universal death through sin, no one can enter the kingdom of God unless born again; and that no degree of reformation however great, no attainments in morality however high, no culture however attractive, no baptism or other ordinance however administered, can help the sinner to take even one step toward heaven; but a new nature imparted from above, a new life implanted by the Holy Spirit through the Word is absolutely essential to salvation. Thus it can be said that our justification is wrought solely by the finished work of Jesus Christ on the cross as He died in our place. Every believer is promised positional, progressive, and ultimate sanctification. All who are born of the Spirit through faith in Christ can have assurance of salvation and are eternally secure in Christ. The church is composed of all believers. It is the body and bride of Christ, formed by the baptism of the Holy Spirit and existing in two aspects, universal and local. The universal church is an elect company of believers, baptized by the Holy Spirit into one body. Its mission is to witness to its Head, Jesus Christ, preaching the Gospel among all nations. It will be caught up to meet the Lord, after which He will return to set up His Kingdom. The local church is a group of believers voluntarily joined together in love to worship God with praise and thanksgiving, and to glorify Jesus Christ through an aggressive effort to disciple others by the preaching of the gospel, and the exercise of spiritual gifts. Gainesville Bible Church is Fundamental, Evangelical, Non-Charismatic, and denominationally unrelated. Spiritual gifts are God-given abilities for service, i.e., "for the equipping of the saints for the work of service to the building up of the body of Christ." Christians are called to a holy life of service and testimony in the power of the Holy Spirit, which service includes the propagation of the gospel message to the whole world. There is promised reward in heaven for faithfulness in such service. The Bible sets forth two ordinances, the Lord's Supper and Water Baptism. The Lord's Supper is to be celebrated regularly in remembrance of Christ's death on the cross, and in expectation of His return. Water Baptism is an outward testimony of a person's belief in Christ. Immersion is the ideal means set forth in Scripture. Angels were originally created holy, but now, because of Satan's rebellion, there is also an unholy angelic kingdom. God has revealed different dispensations or stewardships with corresponding rules of life, of which the present dispensation is the stewardship of grace. The blessed hope of the church is the imminent return of Christ. The events of the return of Christ take place in the following order the rapture of the church, the tribulation, the second advent, the establishment of the reign of Christ on earth for one thousand years, and finally the eternal state of punishment for the unsaved and the eternal state of blessing for the saved. Copyright © 2016 Gainesville Bible Church. All rights reserved. 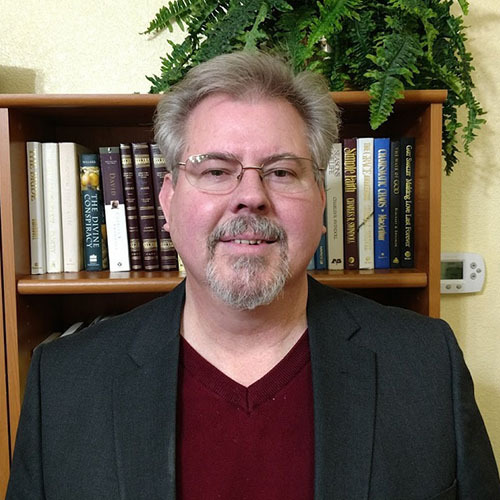 Pastor Mark Wascom is a 2003 graduate of Dallas Theological Seminary where he earned the Masters of Theology degree. Before he came to Gainesville Bible Church he served as pastor of Lake County Bible Fellowship in Lakeport, CA. for nine years. He and his wife LaVonda have three daughters: Sarah, Kirstin & Hannah and they enjoy being back in close proximity to their grandchildren: Seth, Scott and Sophie who live in Crosby, TX. Mark and LaVonda are originally from Walker, LA and are both fond of the great outdoors. Mark likes classic cars, motorcycles, old tractors, guns, guitars and good food. Mark finds his anchor in this world in the sovereignty of God, the Truth of His Word and the fellowship of His people. Mark was born and raised in Arkansas, and attended the University of Arkansas where he met his wife Sandra. Recently celebrating 30 years of marriage, they are the parents of two boys: Byron, of Dallas and Matthew, who went to be with Our LORD in 2012. Mark continues to be involved in the construction materials business- since first working at a sand and gravel plant in the summer at age 13. Raised in the Methodist faith, Mark and his family started attending the non-denominational Stonebriar Community Church/Frisco in 1999. 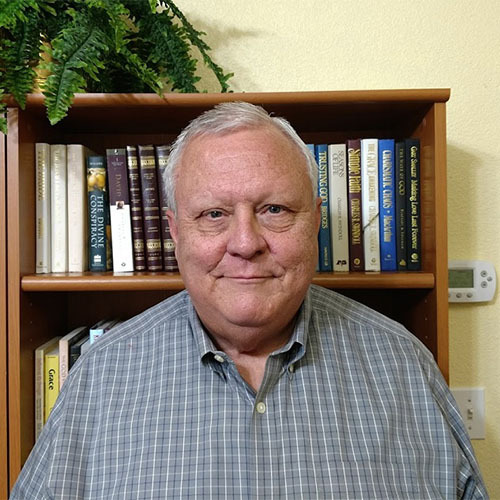 After moving to the Gainesville area in 2014- Mark sought a church where the Word of God is unabashedly proclaimed--and found it at Gainesville Bible Church. Mark's life verse: Isaiah 55:8-11. Bill was born and raised in New Jersey. He enlisted in the Marine Corps. for four years then graduated from Rutgers University. He and his wife Carol, from Maryland, have been married since 1964; have a son and daughter and seven grand-children. Golf, fly-fishing, and gardening helps to keep this retired IBM'er busy. After growing up Lutheran, both Bill and Carol came to the Bible Church family where they found a spiritual fulfilling expierence and have continued to grow in their faith. 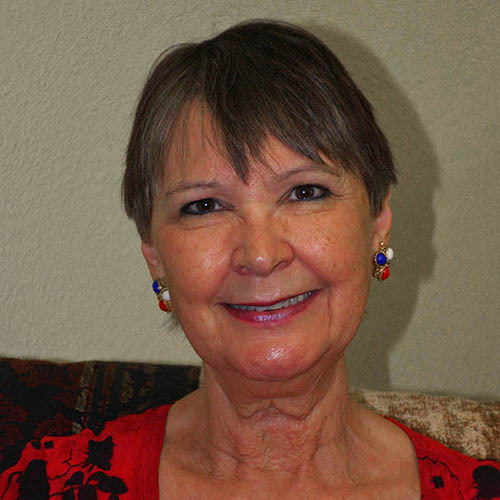 Vivian was born in Gainesville, Texas, and attended grade school in Muenster and graduated from high school in Era, Texas. She earned an Associate's Degree in Journalism from North Central Texas College (then called Cooke County College), and a Bachelor's Degree in English and Political Science from Texas A & M Commerce, Texas (then East Texas State University). She went on to earn both her Masters and PhD in English from Texas Woman's University in Denton, Texas. 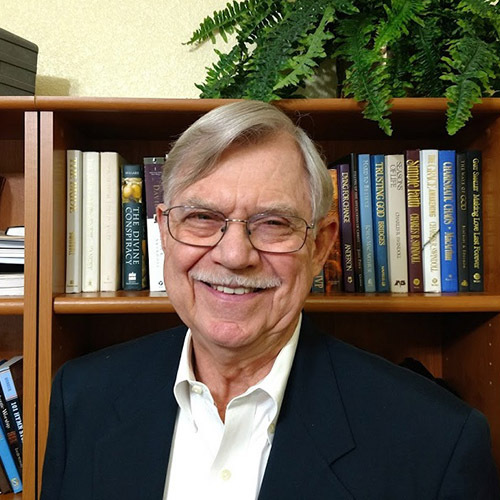 Vivian joined GBC in June 2015 as church secretary and active church member after retiring from college professorship at Cameron University (associated with OU) in Lawton and returning home to Gainesville. She owns an 1890s Victorian home in Gainesville, and her passions are Bible study, evangelism, antiquing, and public speaking.